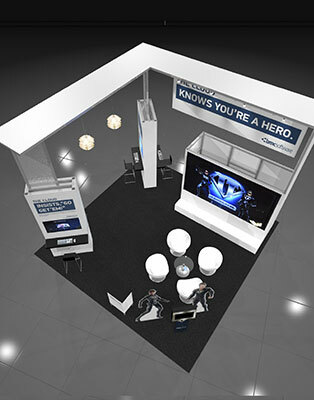 Together with 2020 Exhibits, plans were made to design and deliver an exhibit experience that would push further an already beloved idea: The cloud knows you’re a hero. BMC sought an environment that would embrace these heroes, making them feel comfortable and right at home and create an environment and an experience that would recognize and celebrate these tech experts for the unsung heroes that they are. Once inside with badges scanned, staffers invited visitors to join them as their IT superpowers came to life through custom comic book illustrations. 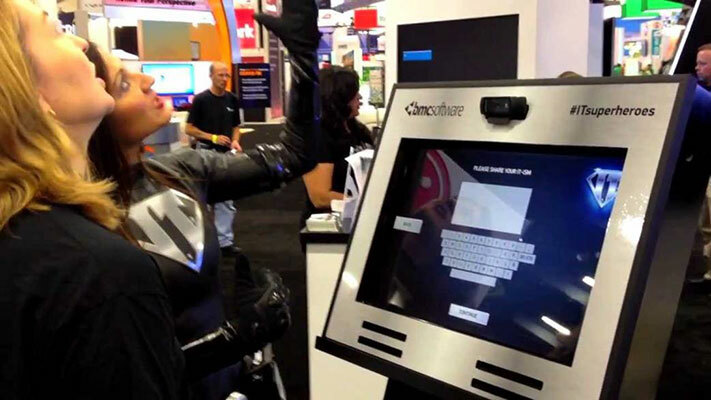 Asking one key question: What makes you an IT Superhero? Because even when faced with the most complex #IT issues, #ITsuperheroes don’t break a sweat. 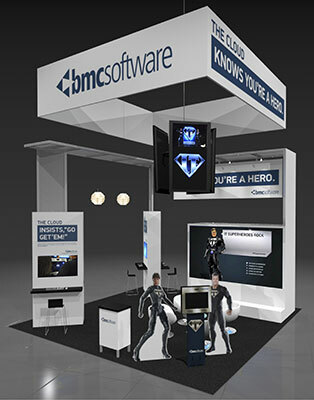 In addition to BMC’s very own super hero team, superheroes could be found in the booth serving as the perfect jumping off point to initiate and deepen the conversation. Projecting a bold presence, the BMC VM World environment gave a voice to I.T. through compelling copy which spoke to the heart of the VM World audience. 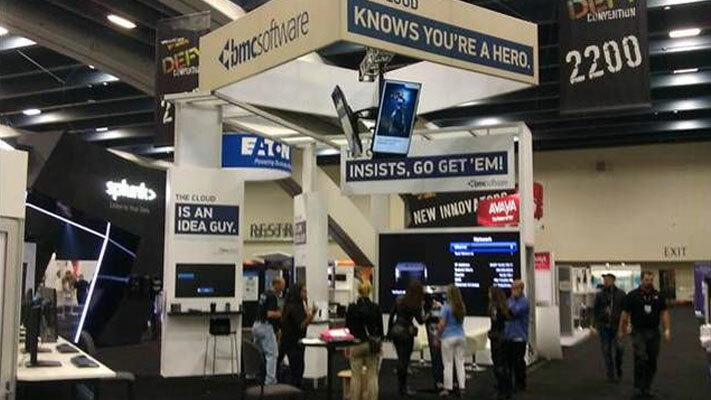 BMC’s messaging and brand was big, bright and bold, showcased across a tech-heavy environment, including video walls, hanging signage, jumbo 90” screens and individual 46” one-on-one kiosk stations. The bright and well-branded environment was anchored by an open and inviting with hanging multimedia screens and super hero touch screens, engaging the demographic through active participation. IT superheroes were celebrated as part of the League of Superheroes with custom comic book illustrations, touting their super powers for IT good! With a comfortable and inviting environment, BMC’s super hero visitors had ample space and opportunity to spend time with the BMC team, and to sit back, relax and enjoy the experience. With IT super-fied heroes gathering and learning more from the cloud cycle life management demos in the exhibit, traffic and buzz were at an all-time high. Go get ‘em, indeed.